The Seth Ramnath Daga Trophy provided a electrifying finish with top weight Clymene fighting a gritty battle only to lose out on the last stride to Excellent. Clymene cruised into the lead early on start and accelerated sweetly on turning for home. Excellent (Excellent Art – Skyelady, Villoo’s Greenfield Farm) quickly moved up to second and set off on the long-drawn chase. Holy Smoke added to the thrill making progress along the rails, while Gazino was made to wait a tad bit longer before he could get a clear run and go all out. Clymene fought every inch of the turf and shaped well coming into the final furlong; Excellent looked a threat as he started to inch closer with every stride. The class factor in the Dallas Todywalla ward is what tilted to race in favour of Excellent and add to it a sublime piece of hard and determined riding by ace jockey Sandesh was just the right mix to ensure a triumphant return after a keen battle. Excellent timed his run to perfection and just managed to stick out his nose right on the wire! Gazino finished on the haunches of the pair in front with Holy Smoke a neck behind. Sandesh had piloted trainer Dallas Todywall’s Belenus (Arazan – Lovely Kiss, Poonawalla Stud) to another narrow victory, this time staying in front and holding on as they flashed past the winning post. Belenus took a flying start and led comfortably until they turned for home. Belenus had a handy lead with about 400 meters to go and Sandesh urged him on to stay ahead. Majestic Warrior got down to chase Belenus but was running a bit green at a crucial stage. He shifted out and that was suicidal. Belenus escaped to victory as the late but powerful charge from Majestic Warrior came in a tad too late as Belenus prevailed by a narrow margin. See The Sunrise covered some ground and did well to take the place stakes. Sandesh capped the day with a third success this time atop hot favourite Shivalik Queen, who too was stretched all the way to the wire. Shivalik Queen (Saamidd – Queen of Normandy, Hazara Stud) quickly moved up to second as Speedo led them all the way into the homestretch and then faded out. Shivalik Queen assumed command soon on straightening up and Sandesh had the Faisal Abbas trained filly hard held waiting for just the right moment to step on the gas. Brave moved up threateningly on the outside, while Pleiades switched to the inside railing. A three way battle ensued and Shivalik Queen had to dig deep to the challenge brewing from either side. Sandesh rode out hard and managed to thwart the challengers effectively and Shivalik Queen notched up her second career victory displaying good fighting qualities. Pleiades fought hard and finished a good second while Red Carnation pegged back Brave for place money. Malesh Narredu trained Excellent Sorrento (Excellent Art – Sorrento Steel, Villoo’s Greenfield Farm) provided an encore, winning the opening race of the day by a narrow margin, but without really looking in any danger. He moved up from third to get past Auroden and Western Front and galloped well to build up a sizable lead, leaving the others to do all the hard work to chase him down. Zanzibaar was up for the challenge and started bridging the gap, while Truly Epic was taking his time to warm up and gallop on even-keel. However, Excellent Sorrento kicked on gamely to stay on ahead winning by half a length from Zanzibaar and the fast finishing Truly Epic. Debutante Whydah (Whatsthescript – kilkenny, Nanoli Stud) trained by Faisal Abbas and ridden by P Trevor, pulled of successful start to finish essay and delighted his supporters with an exciting win. Whydah led them into the straight and surged further ahead past the 400m. Turmeric Tower came along with a big challenge and may have even headed Whydah briefly. However, Whydah fought back bravely and wrested back the lead with not only Turmeric Tower, but Chephirah and Despacito breathing down her neck. The top four finishers ended in a close bunch. Thomas Hardy was a big disappointment after his fine showing on debut. He was taken to win again and was at miserly odds. He shaped well coming into the straight leading by a fair margin but when challenged by Gentillesse, he surrendered meekly without offering any fight, Gentillesse (Varenare – Si Gentille, Equus Stud) picked up momentum and breezed past Thomas Hardy to inflict a telling blow and win by close to three lengths. Thomas Hardy ended a tame second. My Precious managed to pip Flying Dragon for the third spot. For the professionals, trainers Dallas Todywalla and Faisal Abbas saddled a double each, while jockey Sandesh was the star of the day with three winners. 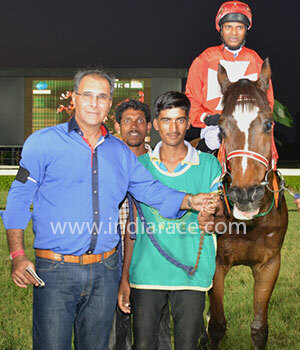 Jockey Neeraj Rawal chipped in with a double as well.